Duvall - Edison is the 13th most walkable neighborhood in Dearborn with 3,313 residents. Duvall - Edison does not have many bike lanes. Nearby neighborhoods: Ford Historic Homes, Oxford, Morley, North Dearborn Park, Southwest Outer Drive, Fort Dearborn Manor and Gindely. Some errands can be accomplished on foot in Duvall - Edison Dearborn. Duvall - Edison is the 13th most walkable neighborhood in Dearborn with a Walk Score of 65. Find apartments in Dearborn's most walkable neighborhoods: Woodbridge, Georgetown Commons and Colson Ruby. 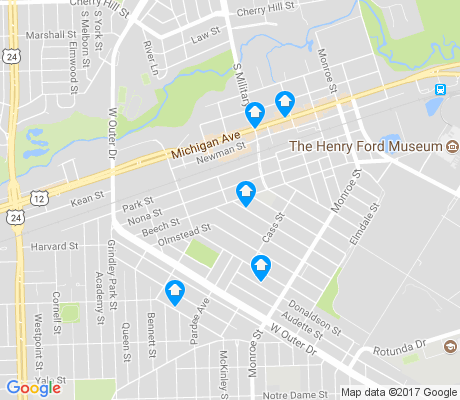 Compare Duvall - Edison to other Dearborn neighborhoods. There are about 64 restaurants, bars and coffee shops in Duvall - Edison. People in Duvall - Edison can walk to an average of 1 restaurants, bars and coffee shops in 5 minutes.